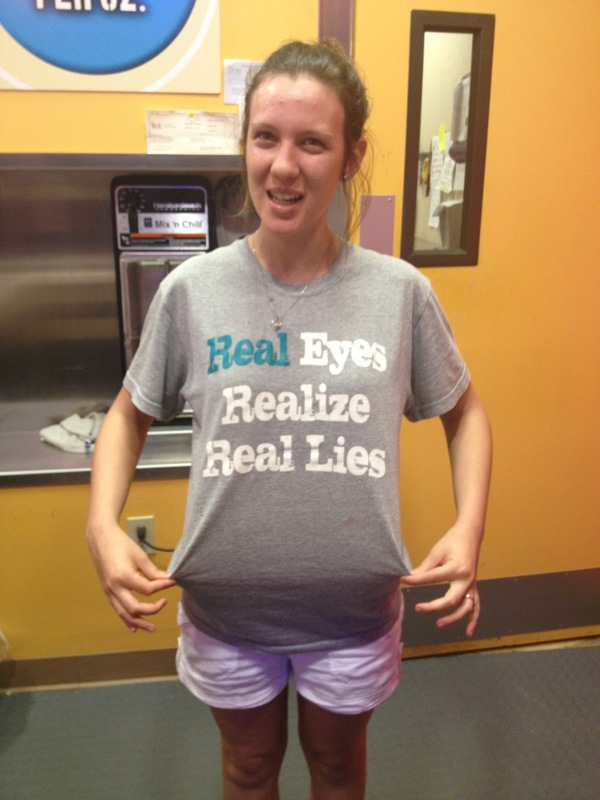 “Real Eyes realize real lies” was on the front of a young ladies tee shirt in Lafayette, Lousiana. I was captured by the truth of the statement. People that lie are hiding behind their fears. People that lie that have no fear are evil. That is right evil. It does not matter that they are in the church or outside the church. Lies are demonic! If those lies are because of fears the lies can paralyze you. It may that some person or organization is trying to keep you from stepping up and not showing them up. Step up and their lies are exposed. It may be that lies are told to intimidate you so that your brilliance is dulled. You could never shine brighter than the liars lest your brightness reveal their stupidities. If you live with the lies you will find yourself unhealthy and sickly. Your spirit will war with your flesh. Something in you says, “something is wrong!” But you cannot put your finger on it. Get alone with God in prayer and in the Bible. If others do not line up with the Word and the spirit then draw the line. Always follow The Lord and His Word and courage will manifest itself. You must identify the truth or you will never find your true identity. The truth can be painful even to those who expose it. But not as painful as a life chained by fear. If the lies you are believing is a thinking system then expose it and move on. Examples may be that you trusted in a system, organization, a plan that is not reaping the results you thought. Maybe you thought a Masters Degree would get you the better Church or job. But you find yourself frustrated because no doors are open. Maybe you trusted in a church but the practice is not what you understand from the scriptures. Maybe it is leadership you once looked up to and now find those same individuals with shadows. It could be that you are just a timid person that finds decisions difficult to make. So you follow the crowd letting others make the decisions. But all the road signs are leading you to the wrong destination. As one man said, “If ten million people believe on a bad idea, it is still a bad idea!” Don’t drink the koolaid prepared in the secret kitchens of others. Again get in the Word and pray for the truth. Once you know the truth decide to follow it. You do not have to take large steps. It may be that all you do first is stop following, turn around and eventually find your path back to what is right. Once you do this, the courage of that decision will give you the answer for the future steps. Fear is a horrible master! Don’t allow fear to make you his slave. God called you to be free. Close your ears to the jeers and move to the truth. Yes, Real eyes, realize real lies! Real men follow truth and never the lies!